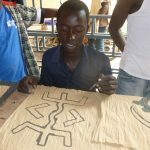 Kader started teaching children to create bogolan cloth in the courtyard where he lives in Lafiabougou soon after he graduated from Mali’s National Institute for the Arts (INA). Activities spread into the street outside and other venues across the city. Some children were referred by statutory agencies, some came from NGO drop-in centres and others referred themselves. PAD was registered as an Association in 2004 and started to offer regular courses several times a year. In 2012 a nearby house was rented as a residential centre and the team of project workers expanded accordingly. 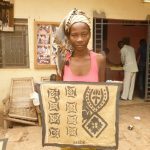 The team includes the accountant, a secretary, a cook and several project workers who are from time to time joined by artists and other visitors from around Mali, West Africa and further afield. This contributes to a rich and changing environment where everyone learns from each other. Up to 25 children attend each 90-day course and courses run 3 or 4 times a year. Some children sleep at the centre and others come daily and food, clothes and learning materials are provided. The main activity is bogolan art, but children also learn basic literacy and develop dance, theatre and a range of arts and craft skills. Leadership and problem solving are encouraged – decisions are made communally, and daily tasks are shared. 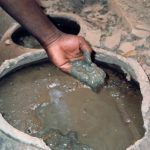 As well as intensive work with individuals through the activities, efforts are made to resolve health and other problems. When ready, each child shares his or her story and may decide to try to re-join their family, go to school or become independent, supported by the PAD team. The complete acceptance, love and care that they receive enable children to feel better about them-selves. In this environment no question is taboo, and learning occurs place through conversation, debate, fables and stories, very much in the African tradition. PAD has helped over a thousand children and works with over 100 children every year within a wide age range and spectrum of needs. Many children continue to frequent the centre after their course has finished. Past graduates often drop in and their stories of survival and success serve to inspire younger children, and for those who are not doing so well there is always a sympathetic ear in times of trouble. This is a lovely footprint bogolan sheet created with some children who had Noma, a very disfiguring facial disease (http://www.nonoma.org/en/). The local hospital consultant phoned PAD and asked if there was anything that could be done to cheer up this group of children, who had come into Bamako from the villages to have their annual session of treatment at the hospital. There children had a lot of fun and this is the result.